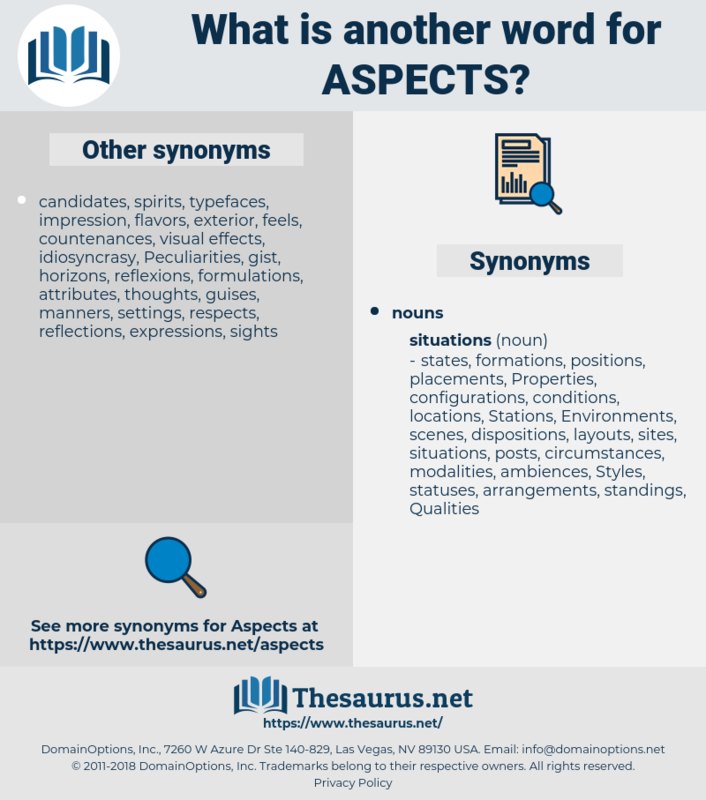 What is another word for aspects? 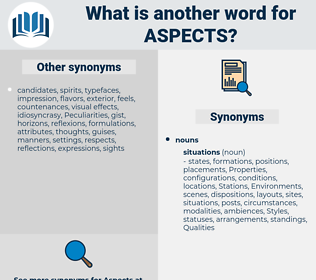 assets, ways, Activities, portions, Difficulties, sides, developments, sites, circumstances, factors, experts, Parties, matters, nations, Studies, subjects, parts, facts, conditions, features, ingredients, situations, affairs, problems. circumstances, factors, matter, matters, element, subject, subjects, parts, details, facts, conditions, consideration, part, essential, features, information, ingredients, particulars, development, content, fields, district, sector, operative, education, dimensional, section, sections, pieces, situation, situations, Measurements, administration, partially, Relating, case, realm, segment, item, portion, proportion, related, certain, material, environment, status, relevant, a., industry, affairs, charter, challenges, report, c., commission, republic, addressed, selected, government, action, economic, framework, taiwan, party, size, sizes, general, china, partial, island, any, regional, crisis, policy, business, drivers, legal, december, b., property, Properties, ", review, blocks, Queries, on, canada, Inquiries. communications, manifestations, techniques, steps, cornerstones, purposes, respects, PROSPECTS, Peculiarities, assets, subcomponents, instances, principles, operations, Particularities, shortcomings, ways, chapter, chapters, substances, concepts, relationships, comprehensively, effects, specifications, fundamentals, contents, connotations, countermeasures, Characters, objects, Capabilities, authorities, segments, means, shapes, statistics, terms, things, IMPACTS, obstacles, specific, specifics, subparagraphs, Emphases, Measures, implications, determinants, sub-components, attributes, times, outcomes, infrastructures, mechanisms, descriptions, repercussions, Recommendations, perpetrators, transactions, structures, contexts, conceptions, stakes, compartments, acts, clauses, quarters, sensitivities, projects, metrics, specificities, practices, constraints, dynamics, sustainability, disciplines, strategies, milestones, differences, occasions, Phases, Phenomena, ec, locations, proceedings, requirements, scopes, provisions, relations, subsectors, Criteria, parameters, surfaces, stages, initiatives, courses, sub-factors, sub-sectors, demonstrations, tasks, pictures, pattern, patterns, cooperation, consequences, partners, professionals, threads, Orientations, indications, observations, viewpoints, packages, districts, premises, prerogatives, products, constituents, passages, dispositions, agreements, indicators, technologies, Achievements, rates, responsibilities, Tendencies, Paths, prefectures, spots, themes, clarifications, contributions, reservations, causes, cases, Possibilities, Occupations, further, organisations, Consultants, places, improvements, modalities, clusters, processes, flaps, technical, sectors, Categories, personnel, marks, conclusions, Capacities, Resources, Promoters, objectives, Activities, Realities, leaders, directions, instruments, values, integral, arrangements, endeavours, articles, proportions, deliverables, portions, Incentives, expressions, examples, limitations, Regulations, proponents, statements, profiles, commitments, customers, Suggestions, establishment, competencies, pillars, troops, Difficulties, costs, reasons, developments, positions, nuances, traits, transfers, Environments, reflections, sites, priorities, procedures, Consultations, Towards, services, cultural, messages, streams, settings, highlights, strands, senses, moments, contours, headings, Publications, speakers, sources, images, weaknesses, Inequalities, ends, Faces, recitals, realms, qualifications, Tests, states, innovation, niches, proposals, planes, Persons, scores, others, endpoints, lessons, tools, options, regarding, systems, SLOPES, organization, Organizations, trends, Photos, jobs, disputes, Angles, inspectors, sessions, players, shutters, experiences, Classes, strengths, notions, reports, materials, methods, signals, seminar, dossiers, chains, ministers, Standards, departments, factions, Tracks, pressures, tiers, Stories, legs, targets, types, backgrounds, guises, ramifications, bits, Opportunities, volets, WEBSITES, documents, parliament, parliaments, influences, victims, amendments, quality, Qualities, registers, portfolios, touches, tenets, Records, prevention, bearings, sets, Deficiencies, Guidelines, corners, talks, localities, vouchers, fulfils, Ideas, panels, thrusts, programmes, data, Registries, events, approaches, expenses, barriers, Securities, words, planned, frameworks, WINDOWS, layers, changes, arms, sub-items, discussions, circumstances, references, Industries, variables, PAGES, responses, findings, wordings, modes, advantages, hallmarks, Duties, functions, CAMPS, limits, sponsors, actions, skills, arguments, insights, Entities, agents, Efforts, Involving, Companies, Abilities, boards, schemes, actors, earmarks, interests, Facilities, factors, hours, circles, periods, deadline, regions, Governments, stakeholders, shafts, abuses, inputs, results, crossings, FORMATS, civilians, roads, mandates, tables, remarks, officials, protests, designs, Goals, prongs, shadows, aims, Parties, stitches, benefits, fronts, views, nutrients, spindles, signs, nutrition, shores, levels, edges, horizons, Communities, axles, choices, Branches, Foundations, linkages, gaps, routes, individuals, Roles, Cells, people, origins, extremes, matters, paragraphs, forces, comments, Students, thoughts, merits, texts, Entries, outlets, grounds, links, Houses, knowledge, drainages, Budgets, compounds, Infants, trails, Universities, plans, PORTS, Clients, Newborns, shares, zones, avenues, members, PTS, titles, levers, apply, fully, bullets, kinds, opinions, Programs, demands, months, sorts, Axes, Policies, vents, works, dots, Subsidies, covers, Boundaries, Territories, Refugees, Grants, subjects, walks, Lives, answers, rules, reforms, Arenas, Ones, parts, fold, Forums, details, models, authors, facts, Bodies, needs, Blinds, homes, Indices, Forms, Missions, Bases, Rights, figures, looks, noodles, accounts, Countries, Gains, conditions, powers, OUTS, counts, guys, runways, leads, norms, york, councils, orders, flows, kb, units, deals, united, features, 1998, 24, rounds, ingredients, Having, particulars, development, fields, sections, pieces, situations, Measurements, segment, item, environment, affairs, challenges, LINEs, problem, problems, framework, sizes, drivers, Properties, ", blocks, Queries, Inquiries. respects, relates, comprises, contains, Has, highlights, Faces, regarding, matters, Does, subjects, features, concerns, Queries. Third, though his theme had many aspects, and these varying aspects Kossuth presented with such skill as to command the attention of his hearers, yet his theme was always the same, - the wrongs of Hungary. In the history of mankind various aspects of the population question are familiar.